You are here: Home / How to Travel Alone / No Money to Travel? Here’s What You Do. No Money to Travel? Here’s What You Do. Sometimes my need to travel exceeds my financial means. Yet the need is visceral. It’s may be called itchy feet by some but I experience it in my chest. It may sound weird but that’s where I feel an agitation to travel in my body. And the feeling is palpable. Fortunately I can honestly say that I have enjoyed every place I’ve traveled. True, some destinations are more exciting than others but I always find something of interest. It may be the history or the music scene. It could me many things but amongst them is almost always the people. People are fascinating no matter how much you have in common or how little. So given that I can find enjoyment everywhere, I can fulfil my need for travel even if my budget is not great. Here’s how. If you have zero dollars to spend you need to lean a bit on people you know, develop new connections and get creative in the sharing economy. From Couchsurfing to Women Welcoming Women WorldWide, there are organizations that can help you with free accommodation. But it’s best to be a participating member well before you leave so that you have a good reputation and some earned goodwill behind you. 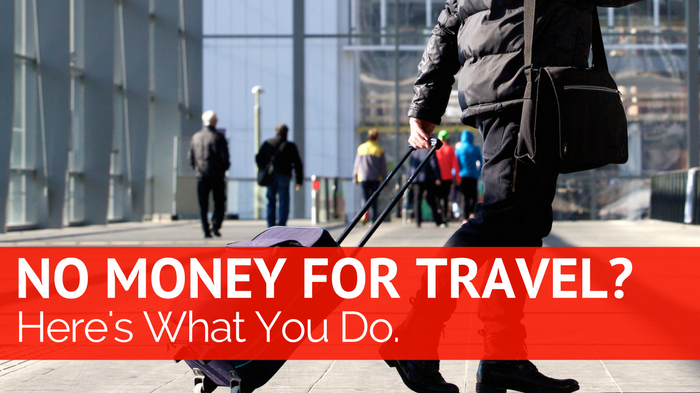 To be realistic, you will have expenses as you travel just as you would at home. Fortunately there are ways of making money before you go that will also help you earn on the road. Read these posts at least 6 months before you plan to travel. The Sharing Economy for Travel Saves & Makes You Money! Connections count when it comes to finding free accommodation. Distance counts when it comes to the cost of transportation. Decide on your destination by balancing the two. Generally, the closer to home you stay the more you’ll save. Read: Most Surprising Cities: You May Not Have to Look Far. Use communities like Couchsurfing or Women Helping Women WorldWide. With both, accommodation isn’t guaranteed but there is a community that can be valuable. Read Cheap One-Way Car Rentals… Really? Really! for a variety of ways to get free cars to drive. Reach out to your network to look for a drive sharing opportunity. Consider KangaRide, a Canadian site. The community seems small but it has some interesting endorsements. For safety reasons, getting into a car with a stranger is not something that I recommend however with their customer support line this looks like a safe option. Try Skyscanner’s “Everywhere” button. It will give you a list of flights from your airport from cheapest to most expensive. Match the cheap flight with your free accommodation and, again, you’re doing well. Don’t forget walking and cycling. They are absolutely free and a joy unto themselves. Once you’re at your destination you’ll want to explore. Most major cities have free walking tours but that’s just the beginning of free. Here are some posts with tips on how to get the best out of your destination without spending money at all.